The Y-noT Project is honored and humbled by the tremendous outpouring of community support for the Borcia family and for our cause. Your financial support is also very much appreciated, and is essential for The Y-noT Project to accomplish our goals. We feel it is important for you to know where your donations go. 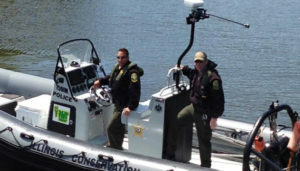 An intensive, 56-hour Coast Guard training course for 18 DNR and Lake County Sheriff patrol officers. We are beginning to see evidence that these investments are paying off. DNR increased the number of citations issued in 2016 by 18%, and the number of warnings by 14%, demonstrating the effect of their increased presence on the water. And the DNR’s increased focus on OUI enforcement resulted in a reduction in accidents, injuries and fatalities on Illinois waterways in 2016. For more details, see the DNR’s annual report at https://www.dnr.illinois.gov/safety/Documents/BoatingAccidentReport2016.pdf. The Y-noT Project has provided grants to AAIM to support its Victim Services programs. These programs are essential in helping the families of victims of impaired drivers and boaters navigate the legal system during criminal proceedings against the impaired drivers. In addition, AAIM provides grief support groups which bring together people who have suffered similar tragedies. The Borcia family will be forever grateful to AAIM for the support it provided to them during their ordeal following Tony’s death. The Y-noT Project has provided grants to a University of Wisconsin peer support group for students grieving the illness or loss of loved ones. The Y-noT Project has many more projects in the works; be sure to visit this page again for updates! The Y-noT Project has not used any money raised from any source to benefit the Borcia family. pledges it will never use its financial resources for any of these purposes.